I promised folks during my Facebook chat today that I would share an excerpt from Rack & Ruin (book 3). I picked this scene because it gives you a little inside look into Sloane and Ash's relationship, why their bond is so strong. It also gives you a deeper look into why Sloane is the way he is, why he's still trying to heal those very deep wounds. This is a tough scene, I won't lie, and while I was writing it, it made me cry. Here, Sloane is in bed with Dex and he's having another nightmare about his past, but this time it's about his childhood. This scene is important for many reasons and it's tied into the plot of the third book, along with what's going on with Ash. What were they going to do to him now? Sloane was strapped to the chair. His ankles, wrists, waist, and head restrained. It always hurt. He’d wanted to hide when they came to his room, but he didn’t want to look like a wimp in front of Ash. Ash never looked scared when the nurses came for him. Now Sloane wished he had hidden. Not that they wouldn’t have found him. There were only the two beds in their room. It wasn’t that he wasn’t grateful. Dr. Shultzon was nice and he brought them toys and ice cream, let them paint their room how they wanted. Sometimes when Sloane was playing with Ash, he would forget where they were, what they were. Until it was time for the tests. This time he’d been stripped down to his underwear. The sticky little white pads were fixed to his skin all over his body, wires coming out of their centers. The pads were cold and sometimes sent little shocks through him. The wires lead to different machines and monitors. One machine monitored his heartbeat, one his brain, and the others—He didn’t know what they did. They looked like the machines in those Sci-Fi movies Doctor Shultzon rented for them from the video store. If only Ash were here. Sloane might not feel so scared then. Sloane closed his eyes, called upon the wild animal inside him. The Felid woke from its slumber and answered Sloane’s call. The transformation started and Sloane gritted his teeth against the pain. The moment the first bone slipped out of place, Sloane pushed it back. His Felid side cried out, confused about why he was being shoved back when Sloane had called for him. The machines around them beeped wildly and Sloane cried out, his body telling him he shouldn’t try to stop the transformation so suddenly once it started. Doctor Shultzon pressed a button and the pads stuck to Sloane’s body sent pulses through him. “It hurts! Please, stop. Please,” Sloane begged. The pulses hurt. They curdled his blood and angered his Felid half. Sloane hissed, his fangs starting to elongate. He fought desperately, pushing the Felid back. “I can’t,” Sloane cried, tears streaming down his cheeks. “It hurts so bad.” Whatever they were doing to him, it made his other half very angry. It wanted to come out and hurt them. Sloane arched up violently, his whole body convulsing as the Felid tore through him. His vision sharpened and his claws started to pierce the tips of his fingers. Sloane couldn’t stop crying. They didn’t understand. Sloane shook his head, his body slammed down against the chair as if by some unknown force. “It’s not like that,” Sloane blubbered, his nose running and sweat dripping down his face. Sloane didn’t know what he was but he did know he wasn’t Human. Dr. Shultzon had told him he was a Therian when he’d first brought Sloane here from the hospital where they’d locked him up for being a freak. Sloane did. He tried to soothe the beast inside him. Told him it was okay. The worst was over, even if only for today. The Felid protested but slinked back into the shadows. Sloane clenched his jaw, his eyes shut tight against the sting and pain of his claws and fangs retracting. A few heartbeats later and the Felid slumbered once again. Shultzon wiped Sloane’s nose with a tissue then ran a damp cloth tenderly over Sloane’s face before he undid the straps restraining him. Sloane’s bottom lip trembled and big fat tears rolled down his flushed cheeks. Sloane nodded even if he didn’t agree. Maybe he wasn’t a monster, but he was a freak and a killer. He’d killed his mom. His dad hurt him and then killed himself. They’d thrown him away. Locked him up and told him he was… an abomination. Sometimes he felt so alone, he wished…. Shultzon led him down the bright white halls and into the elevator where they soon stepped out into another white hall. Every floor looked the same, always white and far too bright. The door to his room opened and Ash stepped out. As if he’d known Sloane was near. Without waiting for the doctor’s okay, Sloane took off down the hall and threw himself into Ash’s arms. Despite being the same age, Ash was bigger, and when his strong arms squeezed Sloane, the tears started once again. He hated crying so much, but he couldn’t seem to stop. “It’s okay,” Ash said gruffly, leading Sloane inside and shutting the door behind him. He walked Sloane over to his bed and sat down with him, holding him while he cried. When Sloane’s eyes and head hurt from crying so much, his nose stuffed, and his throat sore, he pulled back and wiped his face with his sleeve. Ash seemed to think about that then shrugged as if giving in. Sloane pushed on. “Okay.” Ash breathed in deep, puffing up his chest. It was as if he weren’t afraid of anything. “Got it.” Sloane couldn’t help his smile. Then the door closed and he was alone again. Ash would be back soon. He had to be. It was the only thing Sloane had to hang on to. Shutting his eyes tight, Sloane dreamed of the day they’d be free. He even dared to hope he’d have a normal life with someone who cared about him, who wasn’t afraid of him. Maybe even… love him. 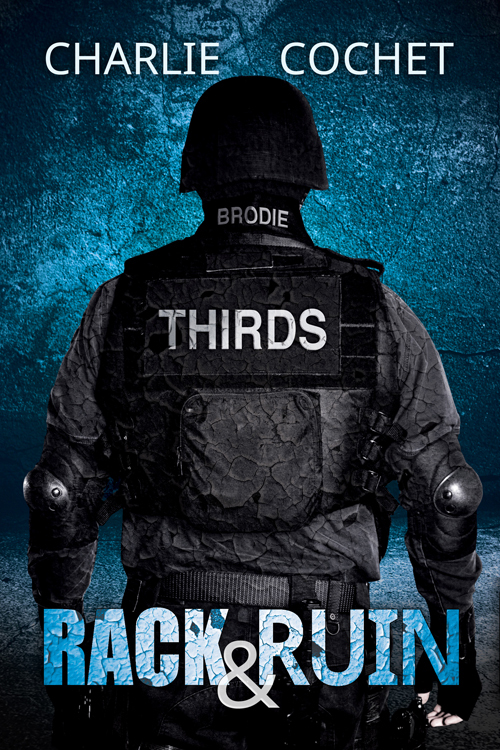 Rack & Ruin (THIRDS, Book 3) Cover Reveal & Giveaway! Hello all! Welcome to the Rack & Ruin (THIRDS, Book 3) cover reveal & giveaway! I'm super excited to share with you the cover for the latest THIRDS book by the fabulous L.C. Chase! There's also a giveaway, and Rack & Ruin is now available for preorder! The Rack & Ruin Blog Tour kicks off with a twist! Hello all! Welcome to the Rack & Ruin Blog Tour! To celebrate the release of the third book in the THIRDS series we're handing things over to Destructive Delta. 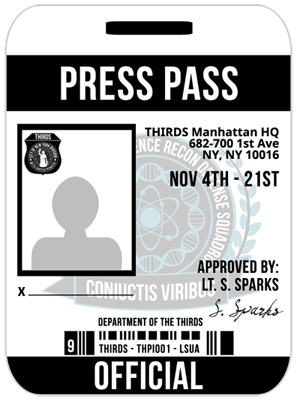 Make sure to drop by Hearts on Fire Reviews to pick up your official invitation from Lieutenant Sparks who'll walk you through the process of shadowing Destructive Delta. Each day you'll be escorted by a different member of the team, starting with a brief intro on day 2 from Sergeant Maddock over at Carly's Books Reviews. If you're lucky, the agents might dish a little dirt on their partners or you might get to join the team out in the field. There will also be interviews with team members and an inside look at their current case (exclusive excerpt). Good luck! 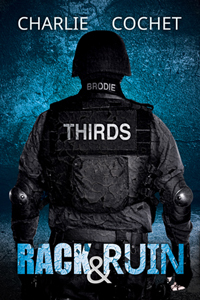 Join SGT Maddock over at Carly's Book Reviews for day 2 of the Rack & Ruin Tour! Hello all! Now that you've picked up your invitation and press pass from Lieutenant Sparks, join Sergeant Anthony Maddock over at Carly's Book Reviews for the second stop on the Rack & Ruin blog tour! Just 2 more days until the release of book 3 in the THIRDS series. Rack & Ruin Blog Tour Day 3 - Join Team Leader Sloane Brodie at The Novel Approach! Hello all! Hope your tour of the THIRDS is going well. Later this morning we have Sloane Brodie, Team Leader for Destructive Delta over at The Novel Approach for the third stop celebrating the release of book 3 in the THIRDS series! What will Sloane have to say about his partner? Drop by to find out.